“How many can YOU eat?” In the spirit of the Fourth of July, the Nathan’s Famous Fourth of July Hot Dog Eating Championship, and the publishing of my teen novel BIG MOUTH, I’m launching a website dedicated to BIG MOUTH and the quirkiest All-American food ever: hot dogs. 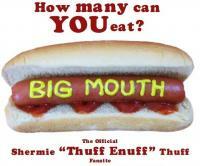 www.BigMouthTheBook.com has excerpts from the book, fun facts about competitive eating, hot dogs, ketchup, etc., and a store that ties into the theme of the book. I had a great time researching the food facts and strange eating habits of this country for the website. I hope what I’ve found will put a smile on people’s faces. Some of the stuff really made me laugh. A museum dedicated solely to mustard? A 170-foot tall ketchup bottle? This country is somethin’ else! I’m kick-starting a fun feature for my websites called “Where in the World…?” “Where in the World…?” lets readers track copies of BIG MOUTH and HONK IF YOU HATE ME as they are “lost” in public places around the world, then found and read and “lost” again. I’m very curious to see who will report in and what their stories about finding the books will be. You can access it through both of my websites–www.DeborahHalverson.com and www.BigMouthTheBook.com. Then there’s the “Me and My Big Mouth” behind-the-book blog series, which has anecdotes about the inspirations, backstories, and other random stuff in BIG MOUTH. I kicked that off this weekend with the blog post “A Word from Our Sponsor.” Other posts on the way are “The World’s Biggest Food Fight” about a tomato-tossing festival in Spain, and “The Sweet Rubbery Chew” about gummi bears. Phew! That covers all of my July excitement. And now . . . I’m plum tuckered and ready for a big nap. Summer projects can really wipe a girl out. There’s got to be a lounge chair with my name on it by a pool somewhere….